AC Infinity steel rack panels are designed for economical use in standard equipment. Each panel is constructed with cold rolled steel and coated in matte-black powder-coat paint for a clean and high-end appearance. The panels can be used to conceal empty rack spaces for a uniform rack appearance and also provides rack rail support. Vent design maximizes airflow and prevents hot spots, while maintaining structural integrity. Features dual flanges and thick 3mm steel gauge for added strength. Supports proper thermal control by directing how the airflow moves throughout the rack and can be used in conjunction with a rack fan system. 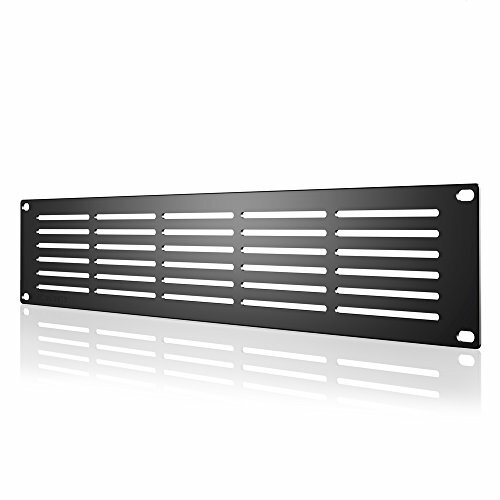 This panel takes 2U of rack space; 1U and 3U blank and vented panels are also available. Designed to be installed into standard equipment racks, and takes 2U of rack space. Vented panel design maximizes airflow while maintaining structural integrity. Top and bottom flanges curved back to increase strength, and a professional appearance.Top and bottom flanges curved back to increase strength, and a professional appearance.